​Creating art of any kind is very cathartic. I find this is especially so with art that has a spiritual message. This is most likely why I am attracted to the Indigenous Arts such as Dreamcatchers, Ceremonial Tools, Mandala's & Aboriginal Dot Paintings. These are among the first Art ever created on this planet. Our Ancestors were so connected to the land. Creating art using clay and pigments from the earth was their way of sharing their stories with clan members and other tribes. Weaving is also a very ancient art created originally by the indigenous peoples using plants and grasses to make baskets and nets for the hunters and gatherers of their tribes. They crafted clothing and shoes from animal skins to be sure the whole animal was put to good use. This was a sign of deep respect, for nothing was sacrificed unless it be used for survival purposes. They held deep respect for their animal friends and always held ceremony and prayed to the creator giving thanks for the animal that sacrificed itself for the good of the tribe. 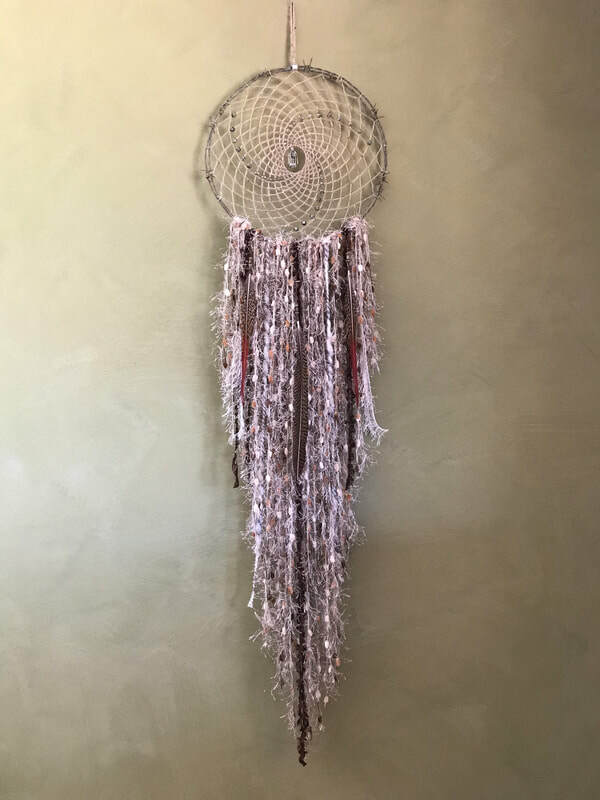 The Dream catchers I create are mostly made from nature & natural materials either found in the wild or purchased from recycling centres. I am often gifted old jewelry from friends to be used in my Art. This is why I feel my art holds so much energy. Nature is life force energy, Prana or chi and is naturally healing. We are all made of energy that vibrates at different frequencies. Art is no different. Most of my art comes with a name and a story with meaning that has been channeled and then forwarded on to those that are open to it. I love to apply Reiki to my art. It is very receptive to receiving it also. As soon as I start to focus on sending the Reiki energy into my art I can feel my hands heat up and the energy begins to vibrate around my hands. I feel like the art draws it in like a vacuum. When I am creating, I feel that I am being guided by my spirit helpers. I believe Art has a way of finding just the right person to take ownership and receive the healing energy that is enclosed in the art~peace. I especially love to make custom pieces as I get the chance to channel with the clients energy and make the piece that is just right for them & their needs. My clients really feel connected to their art peace as they feel the energy within. They become friends with their art, perhaps even life partners. The relationship grows and whenever they are with their art peace they feel at home & never alone. There is communication between the two and it is often felt very strongly. Art is energy. I have always loved nature. As a child, I spent most of my days outside, either playing in the garden or the bush. I do remember talking to my imaginary faery friends in the trees at the back of my primary school. Trees have always been a source of comfort and joy to me. So now, to be creating Art using vines, sticks, crystals & other materials from Mother Earth and especially the trees, it feels so natural, like it's meant to be. I was also a very curious child and often questioned our existence. How did we get here? Is there a God? etc etc. I even started a Bible Study group at a very young age with a couple of my girlfriends. (My first Sister Circle!) This didn't last long as their was much more fun stuff to explore! Throughout my life, my spiritual curiosity never left me. I tried many different churches over the years, but I never felt at home in any of them. Then, in 2008 I discovered Yoga! It was almost immediate that I felt the connection. I found home! In 2009, I completed my Yoga Teacher Training at My Health Yoga in Brisbane and have been practicing yoga ever since. In 2010 I had an awakening. I was given a message and became very aware of The Rising Feminine Energy. I wasn't even sure what this meant, but I felt this huge change within myself and in the Universal Consciousness too. It felt like a turning point and I knew I was to play my part in this change. I have done much study and inner healing since then. However, it is only recently that I feel ready to share my gifts with the community and especially my community of women. I had a vision to redecorate our room underneath the house so that I could facilitate Yoga Classes, Sister Circles, Mini Retreats, Workshops and Art Classes. I have called this room "The Virgin's Parlour". Did you know that in the days of old, "Virgin" meant, "A woman unto herself?". Moon Priestess's were also known as Virgin's. I feel a very strong connection to the "Womb Priestess" lineage. I truly believe we all go way, way back and I also feel that a huge part of the Feminine Energy that is rising on this planet is a call for all women to remember their lineage. Before the patriarch took control of our planet, women were held in the highest order for their naturally powerful gifts of healing and creativity. It is time now Sisters that we re-claim our innate power. Not just for ourselves, but for the survival of our species. Yes, I do believe it's that critical. So lets just say, The Virgin's Parlour is part of my offering to help heal myself, my sisters, my family, my community and our beautiful planet. She is calling us to gather in as many ways as possible. For, when we gather, Magic Happens! Together, we will remember. Together we will heal. Together we can change the world! Together we Rise!